Se ha llevado a cabo un MBI (Mindfulness Based Intervention) dirigido al colectivo de profesionales de empresa, y en concreto de empresas multinacionales en el sector de Tecnologías de la Información con más de 3000 empleados en España. Estas personas se encuentran sometidas a altos niveles de presión personal y profesional, presentando muy frecuentemente un alto estrés laboral con gran dificultad de conciliación entre su vida personal y profesional y con una percepción de elevada inestabilidad laboral lo que provoca en muchos casos una alta reactividad emocional, bajo nivel de motivación y elevado burnout. El MBI realizado consiste en una acción formativa de Mindfulness de seis semanas con contenidos basados en el protocolo MBSR (Mindfulness Based Stress Reduction Program de la UMASS) y una duración total presencial de 20 horas. Esta acción formativa se aplica a cinco grupos de 10 a 12 personas a lo largo de un período de 8 meses, con un total de 56 participantes. El objetivo básico del MBI es aumentar en los participantes la capacidad de percepción y regulación de la atención, la consciencia de uno mismo y del momento presente, disminuyendo la reactividad emocional y la tendencia al juicio continuo como vía de mejora del clima laboral, la motivación y la productividad en la empresa. Los resultados obtenidos tanto cuantitativos con FFMQ: Five Factor Mindfulness Scale y MAAS: Mindful Attention Awareness Scale como cualitativos mediante input directo de los participantes, parecen respaldar claramente la consecución de estos objetivos para este tipo de colectivo, reafirmando a su vez las conclusiones obtenidas en publicaciones previas acerca de los efectos de la práctica de Mindfulness. 1. Baer R.A., Smith G.T., Allen K.B. Assessment of mindfulness by self-report: the Kentucky inventory of mindfulness skills. Assessment. 2004 Sep;11(3):191-206. 2. Baer RA, Smith GT, Hopkins J, Krietemeyer J, Toney L. Using self-report assessment methods to explore facets of mindfulness. Assessment. 2006 Mar; 13(1):27-45. 3. Bishop, S.R., Lau, M., Shapiro, S., Carlson, L.E., Anderson, N.D., Carmody, J., Segal, Z.V.,Abbey, S., Speca, M., Velting, D., Devins, G. Mindfulness: a proposed operational definition. Clinical Psychology: Science & Practice. 2004; 11, 230–241. 4. Bowen S., Witkiewitz K., Dillworth T.M., Chawla N., Simpson T.L., Ostafin B.D., Larimer M.E., Blume A.W., Parks G.A., Marlatt G.A. Mindfulness meditation and substance use in an incarcerated population. Psychol Addict Behav. 2006 Sep;20(3):343-7. 5. Brefczynski-Lewis J.A., Lutz A., Schaefer H.S., Levinson D.B., Davidson R.J. Neural correlates of attentional expertise in longterm meditation practitioners. Proc Natl Acad Sci U S A. 2007 Jul 3;104(27):11483-8. 6. Brown, K.W. & Ryan, R.M., The benefits of being present: Mindfulness and its role in psychological well-being. J Pers Soc Psychol. 2003 Apr;84(4):822-48. 8. Cardaciotto L., Herbert J.D., Forman E.M., Moitra E., Farrow V. The assessment of present-moment awareness and acceptance: the Philadelphia Mindfulness Scale. Assessment. 2008 Jun;15(2):204-23. 9. Carlson L.E., Garland S.N. Impact of mindfulness-based stress reduction (MBSR) on sleep, mood, stress and fatigue symptoms in cancer outpatients. Int J Behav Med. 2005;12(4):278-85. 10. Carmody, J., Baer, R.A., Lykins, E.L.B., Olendzki, N. An empirical study of the mechanisms of mindfulness in a mindfulness-based stress reduction program. Journal of Clinical Psychology. 2009; 65, 613–626. 11. Carmody J., Baer R.A. Relationships between mindfulness practice and levels of mindfulness, medical and psychological symptoms and well-being in a mindfulness-based stress reduction program. J Behav Med. 2008 Feb; 31(1):23-33. 12. Chiesa A., Serretti A., Jakobsen J.C. Mindfulness: top-down or bottom-up emotion regulation strategy?. Clin Psychol Rev. 2013 Feb;33(1):82-96. 13. Craig, A.D. How do you feel — now? The anterior insula and human awareness. Nature Reviews Neuroscience. 2009; 10, 59–70. 14. Davidson, R. J. y Kabat-Zinn, J., et al. Alterations in brain and immune function produced by mindfulness meditation. Psychosomatic Medicine 2003; 65(4),564–570. 15. Farb N.A, Segal Z.V., Mayberg H., Bean J. Attending to the present: mindfulness meditation reveals distinct neural modes of self-reference. Soc Cogn Affect Neurosci. 2007 Dec; 2(4): 313–322. 16. Farb N.A, Anderson A.K., Mayberg H. Minding One’s Emotions: Mindfulness Training Alters the Neural Expression of Sadness. Emotion. 2010 Feb; 10(1): 25–33. 18. Grecucci A., Pappaianni E., Siugzdaite R., Theuninck A., Job R. Mindful Emotion Regulation: Exploring the Neurocognitive Mechanisms behind Mindfulness. Biomed Res Int. 2015;2015:670724. 19. Grossman, P., Niemann, L., Schmidt, S., Walach, H. Mindfulness-based stress reduction and health benefits. A meta-analysis. Journal of Psychosomatic Research. 2004; 57, 35–43. 20. Grossman P., Tiefenthaler-Gilmer U., Raysz A., Kesper U. Mindfulness training as an intervention for fibromyalgia: evidence of postintervention and 3-year follow-up benefits in well-being. Psychother Psychosom. 2007;76(4):226-33. 21. Hölzel, B.K., Ott, U., Hempel, H., Hackl, A., Wolf, K., Stark, R., Vaitl, D. Differential engagement of anterior cingulate and adjacent medial frontal cortex in adept meditators and non-meditators. Neuroscience Letters. 2007; 421, 16–21. 22. Hölzel, B.K., Carmody, J., Evans, K.C., Hoge, E.A., Dusek, J.A., Morgan, L., Pitman, R.K., Lazar, S.W. Stress reduction correlates with structural changes in the amygdala. Social Cognitive and Affective Neuroscience, 2009; 5 (1), 11–17. 23. Hólzel BK., Lazar SW., Gard T., Schuman-Olivier Z., Vago DR., Ott U., Perspect Psychol Sci. How Does Mindfulness Meditation Work? Proposing Mechanisms of Action From a Conceptual and Neural Perspective. 2011 Nov; 6(6):537-59. 24. Hülsheger U.R., Alberts H.J., Feinholdt A., Lang J.W. Benefits of mindfulness at work: the role of mindfulness in emotion regulation, emotional exhaustion, and job satisfaction. J Appl Psychol. 2013 Mar; 98(2):310-25. 25. Institute for Mindful Leadership Survey, 2016. 26. Jaume Aguado, Juan V. Luciano, Ausias Cebolla, Antoni Serrano-Blanco, Joaquim Soler and Javier García-Campayo. 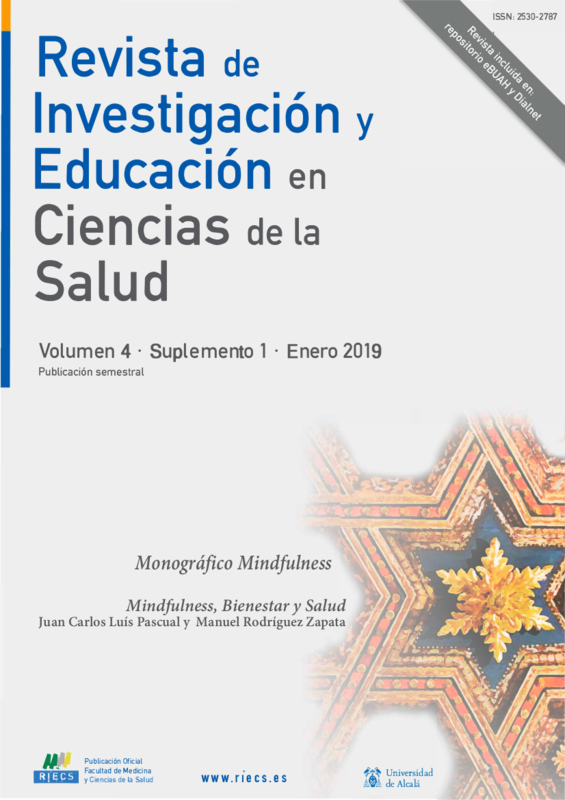 Bifactor analysis and construct validity of the five facet mindfulness questionnaire (FFMQ) in non-clinical Spanish samples. Front Psychol. 2015; 6: 404. 27. Jha A.P., Krompinger J., Baime M.J. Mindfulness training modifies subsystems of attention. Cogn Affect Behav Neurosci. 2007 Jun;7(2):109-19. 28. Kabat-Zinn, J. Full Catastrophe Living. Delta Publishing, New York. 1990. 29. Kerr R., Garbin J. Emotional Intelligence and Leadership Effectiveness. Leadership & Organization Development Journal. 2006 June; 27(4):265-279. 30. Kok B.E., Coffey K.A., Cohn M.A., Catalino L.I., Vacharkulksemsuk T., Algoe S.B., Brantley M., Fredrickson B.L. How positive emotions build physical health: perceived positive social connections account for the upward spiral between positive emotions and vagal tone. Psychol Sci. 2013 Jul 1;24(7):1123-32. 31. Lynch T.R., Trost W.T., Salsman N., Linehan M.M. Dialectical behavior therapy for borderline personality disorder. Annu Rev Clin Psychol. 2007;3:181-205. 32. Lutz A., Heleen A. Slagter, John D. Dunne, Richard J. Davidson1. Attention regulation and monitoring in meditation. Trends Cogn Sci. 2008 Apr; 12(4): 163–169. 33. Malinowski P. Neural mechanisms of attentional control in mindfulness meditation, The Mindfulness Liverpool Model. Front Neurosci. 2013; 7: 8. 34. Milad M.R., Wright C.I., Orr S.P., Pitman R.K., Quirk G.J., Rauch S.L. Recall of fear extinction in humans activates the ventromedial prefrontal cortex and hippocampus in concert. Biol Psychiatry. 2007 Sep 1;62(5):446-54. 35. Roemer L., Orsillo S.M., Salters-Pedneault K. Efficacy of an acceptance-based behavior therapy for generalized anxiety disorder: evaluation in a randomized controlled trial. J Consult Clin Psychol. 2008 Dec;76(6):1083-9. 36. Squire LR. Declarative and nondeclarative memory: multiple brain systems supporting learning and memory. J Cogn Neurosci. 1992 Summer;4(3):232-43. 37. Shapiro, S.L., Carlson, L.E., Astin, J.A., Freedman, B., 2006. Mechanisms of mindfulness.Journal of Clinical Psychology 62, 373–386. 38. Skelton S.A., Roemer L., Orsillo S.M. A Randomized Clinical Trial Comparing an Acceptance Based Behavior Therapy to Applied Relaxation for Generalized Anxiety Disorder. J Consult Clin Psychol. 2013 Oct; 81(5): 761–773. 39. Singer T., Seymour B., O'Doherty J., Kaube H., Dolan R.J., Frith C.D. Empathy for pain involves the affective but not sensory components of pain. Science. 2004 Feb 20;303(5661):1157-62. 40. Soler J., Tejedor R., Feliu-Soler A., Pascual J.C., Cebolla A., Soriano J., Alvarez E., Perez V. Psychometric proprieties of Spanish version of Mindful Attention Awareness Scale (MAAS). Actas Esp Psiquiatr. 2012 Jan-Feb;40(1):19-26. 41. Tapper K., Shaw C., Ilsley J., Hill A.J., Bond F.W., Moore L. Exploratory randomised controlled trial of a mindfulness-based weight loss intervention for women. Appetite. 2009 Apr;52(2):396-404. 42. Teasdale J.D., Segal Z.V., Williams J.M., Ridgeway V.A., Soulsby J.M., Lau M.A. Prevention of relapse/recurrence in major depression by mindfulness-based cognitive therapy. J Consult Clin Psychol. 2000 Aug;68(4):615-23. 43. Tejedor R.& Soler J. Psychometric properties of the Spanish version of the Philadelphia Mindfulness Scale. Rev Psiquiatr Salud Ment. 2014 Oct-Dec;7(4):157-65. 44. Vestergaard-Poulsen P, van Beek M, Skewes J, Bjarkam CR, Stubberup M, Bertelsen J, Roepstorff A. Long-term meditation is associated with increased gray matter density in the brain stem. Neuroreport. 2009 Jan 28;20(2):170-4. 45. Wallace B.A., Shapiro S.L. Mental balance and well-being: building bridges between Buddhism and Western psychology. Am Psychol. 2006 Oct;61(7):690-701. 46. Wallace B.A., Shapiro S.L. Mental balance and well-being: building bridges between Buddhism and Western psychology. Am Psychol. 2006 Oct;61(7):690-701.